We are offering staff, campus partners and the general public off peak membership at Holywell fitness centre. Holywell Fitness Centre is an inclusive environment which is not just for students. The facility boasts a diverse range of members with Staff, Students, Campus Partners and the General Public all welcome. Holywell Fitness Centre consists of a large fitness suite, two fitness class studios and the new Victory Hall sports hall. All the equipment in the fitness suite is the latest Technogym Artis range, including over 75 cardio machines, and over 70 resistance machines. The mix of equipment offers users a wide range of choice to suit the beginner who is new to exercise through to a seasoned athlete. Holywell Fitness Centre consists of a large fitness suite, two fitness class studios and the new Victory Hall sports hall. Get access to Holywell Fitness Centre from 6.30am - 4pm Monday to Friday and full weekend access. Includes free classes, free swimming and free 1-2-1 training. Check out our full list of pricing here. 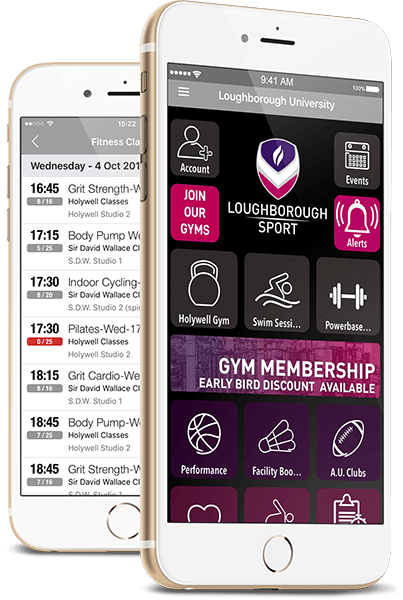 The Loughborough Sport app gives you quick and easy access to book your favourite fitness classes and activities. Containing up-to-date information, news, events, timetables and special offers.